Every now and then I start a painting that I stall on. This rather large acrylic painting of Delphinium is certainly one of those. And I have finally figured out why. It is complex. When I begin a painting, I complete a loose sketch for scale. As I begin to paint I finesse the base sketch as I go along – if needed to differentiate between areas. 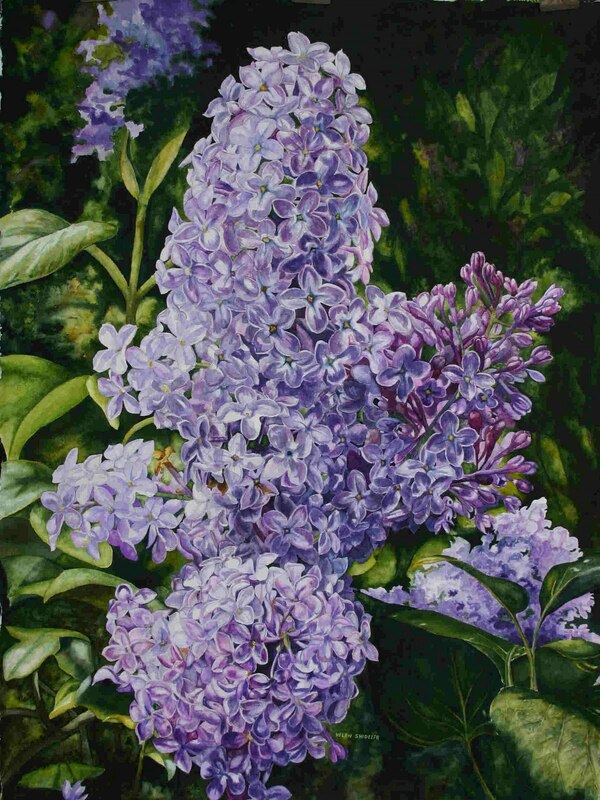 With this painting is very difficult to differentiate between each petal. The colors are vibrant and deep making it very challenging to understand what the shapes and shades are doing. Good thing I know a thing or two about structure of Delphinium and painting flowers. It is always an adventure when you embark to paint a series of related works. In this case, I am experimenting with the Aquabord watereolor painting surface. I really like the vibrancy you can achieve once you figure out how to layre – er, actually, once you realize you have to have patience to let the layres dry completely before you apply the next one. 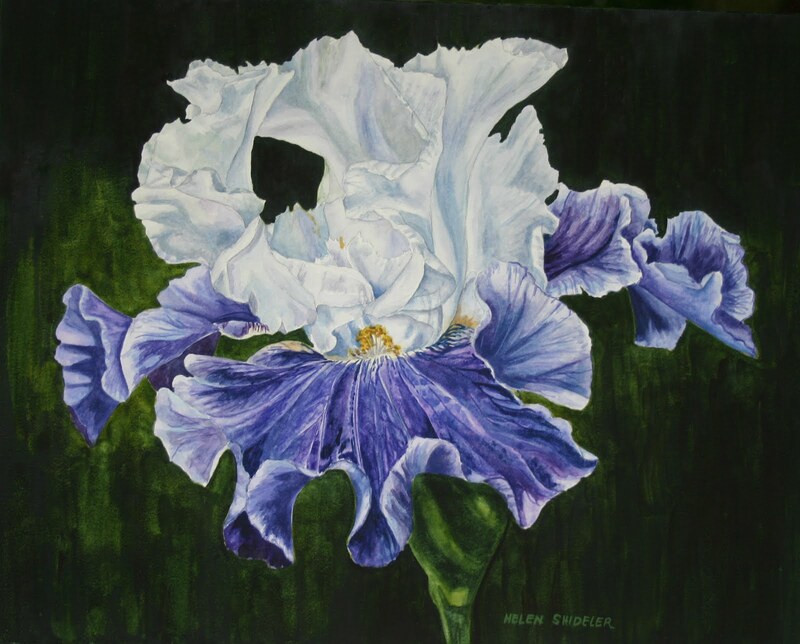 This is an iris from my garden and one of my favourites. We grow a number of bearded irises – but thsi one always stops me in my tracks. The blues are so intense and the white so crisp. A Few Old Fashioned Ladies…. Ah yes, another watercolor on Aquabord. Finally think I am getting the hang of the surface! It is almost impossible to do multiple washes or layring on it – the under colour “lifts” or worse yet – mixes with the top wash. And yet the finished painting is absolutely vibrant. 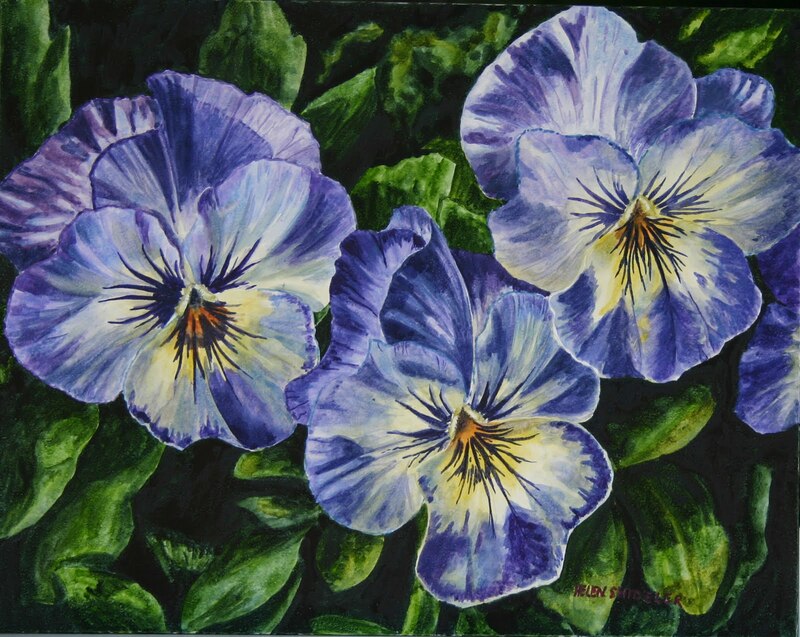 These pansies remind me of the old fashioned ones in every country garden I saw as a child, or the old china teacup with the delightful pansies on them – hence the paintings title. So I link it, and once I figure out a framing solution – I will let you know if I intend to purchase more. I still will admit, for any intricate and serious work, I will always use Arched 300lb cold pressed paper. Oh, by the way – I think they are “bluish” not so purple? New work – and to think I said no more painting with purples for awhile -oh well! Aquabord is a relatively new hard surface for painting with watercolours. The beauty of this surface is that the completed piece is sprayed with acrylic Krylon archival varnish when completed and framed without glass. Thie piece is protected. As so many people now prefer to purchase paintings with out glass in order to emiminate glare from lighting and windows – this is a nice option. The main thing is, the work becomes a mixed media piece (remember the acrylic varnish?) Oh yes, the fraing is also less expensive – less the matting and glass. Aquabord aslo comes cradled – my next purchase will be cradled – then no framing required at all – just finish the edges! The surface is tricky, the colour holds well, but a mis placed drop can remove the pigment. Also, when painting wet-in-wet, I find it harder to get an edge than with Arched 300lb paper. So, I love the surface, nice for a change – but will not be giving up working on paper. I think there should be a drum roll with this….. This was no small undertaking. I have been working on this piece for what seems like forever and a day. What makes this piece interesting is that the more you look at it, the more dimentional it becomes! I went through more paint imaginable on this – I guess this is typical of large works. Always makes me marvel though. Watercolours are seemilgly endless in thier supply until you take on a full sheet. I am ready to retire the mauves… for at least another painting or three. 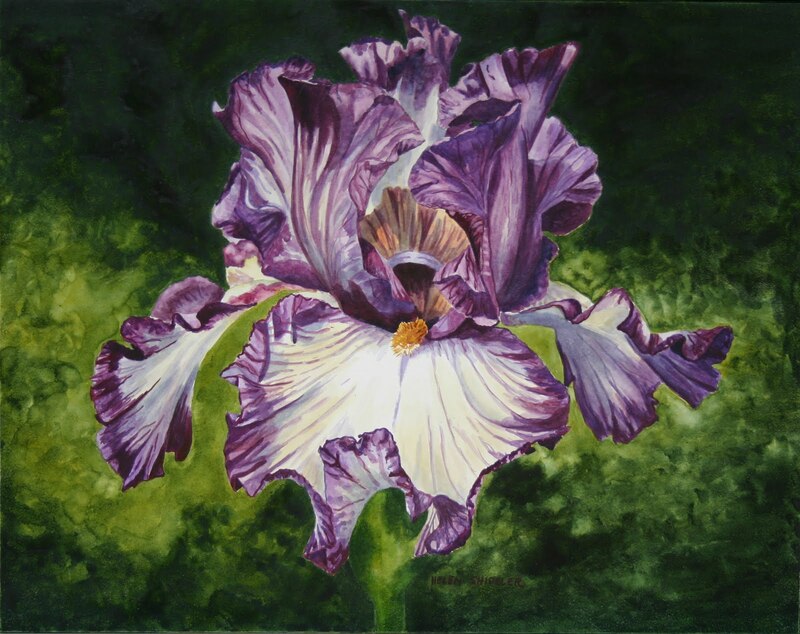 I have already started an iris – shades of ivory, burgundy and a little bit of mauve.